On April 30, 1943 the drowned body of Acting Major William Martin, Royal Marines, and his briefcase of highly classified documents washed ashore in southern Spain. Meanwhile, over in the Mediterranean the Allied Twelfth Army prepared itself for an invasion through the Balkans, unaware that Axis powers had intercepted details from Martin’s briefcase and from Grecian radio traffic and had more than doubled the strength of the troops in their intended target. The Germans peeled forces away from other locations to set up the ambush and the Italian navy fleet set itself in the Adriatic ready for battle. The stage was set for a slaughter. Only there was no Twelfth Army and there was no William Martin. What there were, were bogus troop movements, fake radio transmissions and a poisoned Welshman dressed in Royal Marines gear and given a fictitious identity and falsified documents. Operation Barclay diverted the Axis’ gaze towards the Balkans to clear a path for Operation Husky – the invasion of Sicily – and subsequently the attack on Italy. Hitler and Mussolini had been well and truly duped. Operation Barclay sums up RUSE in a nutshell. Fooling the enemy by feinting one way while going the other – or maybe setting up double-bluffs to really keep heads spinning – is the key to a successful attack. RUSE is a thinker’s paradise. It’s a slow game - some stalemates positively crawl at times with versus matches rarely finishing under 30 minutes and campaign missions sometimes smashing through the hour barrier and far beyond, but chess can also take time and that’s the greatest strategy game ever devised. 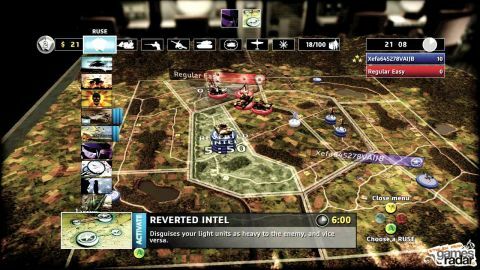 Like most strategy games, RUSE requires you to balance your construction orders by collecting all available resources and building your barracks and airfields to begin researching and mass-producing machines of war. Because the campaign’s the tale of two master strategists (USA’s Major Joe Sheridan and Germany’s General Major Erich Von Richter) only two factions are playable in the main story, but stand-alone skirmishes bring British, French, Italian and USSR nations into action, each with bespoke units in tow. Battles take place on giant maps segregated into grids, all easily monitored with a zooming camera filched from Supreme Commander to great effect. Zoom in and you can manage every individual unit’s placement; zoom out and the tiny models are replaced by poker chips with different colors and sizes neatly denoting allegiance and power. Though RUSE is lacking Endwar’s voice recognition, its pad-based navigation is still light years ahead of every other console RTS’s controls: groups are highlighted with a ‘net’ and segregated into ranks Pikmin-style with a simple button toggle. The mechanics need to become the new console RTS standard. Yesterday. Ruses come in limited, replenishing supplies and turn every battle into a contest to see who blinks first. Matches are filled with second-guessing, third-guessing and fourth-guessing, leading to more panicked redeployment of troops than the day Godzilla rampaged through Tokyo. Yet strip away the deception element and Ruse remains a keenly playable RTS with enough strategy to hold the game aloft even without the tricks. Every unit, every battle and every mechanic just feels right. Infantry hiding in dense forests can ambush and destroy pretty much any ground-based unit single-handedly unless scouted by recon vehicles first, while forests and buildings block all-important unit sight lines to aid flanking maneuvers. Firing ranges of motorized tank killers extend when paired with binocular-enabled recon jeeps. In a field tanks beat troops, but in the confines of a city the embedded party usually wins. Just don’t attempt to play without reading up on the manual first. Some overly aggressive AI and ten buckets of troops at your helm leaves you feeling like you’re juggling chainsaws, eggs and kitchen knives all at once in the early hours. You can see what needs to be done but can’t put everything in motion until every pad shortcut has been mastered. When that’s done, though, RUSE and its smarts crawl right to the top of the console strategy pile to keep Ubisoft bedmate Endwar company. No ruse – just the truth. A real-time strategy game that aims to let you fight on two fronts: the actual battlefield and the percieved one, as you attempt to bluff and feign your way to victory.